OYUnited: WE NEED TEAM LEADERS! This is an invitation to take local leadership to get our government to invest in opportunities for youth for education, employment, and community service. 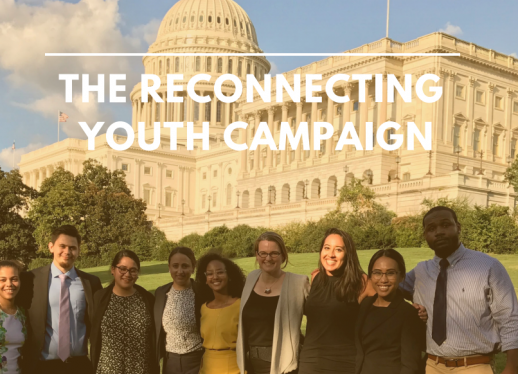 The Reconnecting Youth Campaign (RYC) and Opportunity Youth United are seeking local team leaders to build relationships with federal elected officials (Representatives and Senators) in communities throughout the country on behalf of Opportunity Youth. We already have a great campaign going in DC with fifty organizations on board. But local action is needed. Will you consider stepping up to be a Local Team Leader? We need you! Together we can make a difference! Goal: The Reconnecting Youth Campaign (RYC) is a national advocacy campaign calling on Congress to invest in America’s future by funding 1 million program pathways each year to education, training, national service and employment opportunities for Opportunity Youth. We are requesting an increased federal investment of $4 Billion each year to engage one million young people each year. Currently only 330,000 federally funded opportunities are available. There are at least 3 million low-income young people ages 18 to 24 who are out of school and out of work, who need a chance to build a successful future. Your Role: As a Local Team Leader, you will be in charge of creating a local team of friends and colleagues, setting up regular quarterly meetings with your Congressperson, and leading the effort to get that elected official to support the Campaign’s goal of increased federal investment in opportunities for low-income young people. Bringing local folks into the conversation will radically increase the likelihood of increased investment. We will provide you with training and support and materials. Timeline: Later in March we’ll do an introductory webinar training, then individual coaching calls. Outreach to your elected officials will start in late March and early April. Details will follow when you volunteer. Technical Assistance and Supports Provided: RYC and OYUnited staff will work directly with Local Team Leaders to help coordinate and support meetings with your congressional district offices. You will receive training and support in congressional outreach, the use of talking points, advocacy storytelling, use of data, how to conduct meetings with congressional officials and staffers, and follow-up processes. RESPOND TODAY! IF YOU ARE INTERESTED IN BECOMING A LOCAL TEAM LEADER, PLEASE RESPOND TO DOROTHY STONEMAN, dstoneman@youthbuild.org . We will get back to you quickly. THANKS!